As a society, as a civilization, even as a species, we like to celebrate success. With the Summer Olympics under way in Ye Olde London Towne, we have one of the great examples of how much we humans celebrate success. We give people medals, trophies, money, cereal endorsements, all for outrunning, outgunning, outswimming, outsynchronizing their rivals. We are surrounded by successful ideals in our sports heroes, our political heroes, our war heroes, our super heroes — they are people to be admired and to serve as role models for the rest of us. Hell, some of our super heroes are also hugely successful in other areas of life, such as the billionaires Bruce Wayne and Tony Stark. We all strive for success in what we do; we’ve even been taught that we shouldn’t do something unless we hope to succeed at it, even if it takes years. And yet, there are people who are contradictions: they appear to be trying to succeed by failing, or they appear to worship failures. Which prompts the question: is failing a new way of succeeding? The culture of the “fail” is widespread across the Web. There are whole groups devoted to producing and sharing images, or memes, of “fails”: of things not working the way they were supposed to. The people who brought us the lolcat meme have a whole blog devoted to aggregating such fails. The fail is increasingly going mainstream, moving from instances like “the Fail Whale” from Twitter to appropriation by a Nobel Prize winning economist. For this article, I am focusing on the fail compilation videos of videosharing sites like YouTube. I, like so many others, cannot help but laugh or cringe or stare at these moments of utter failure, often accompanied by pain, that people have shared with the world. But in watching these, I cannot help but wonder why. Why do I respond to them as I do? Why do people do these things? 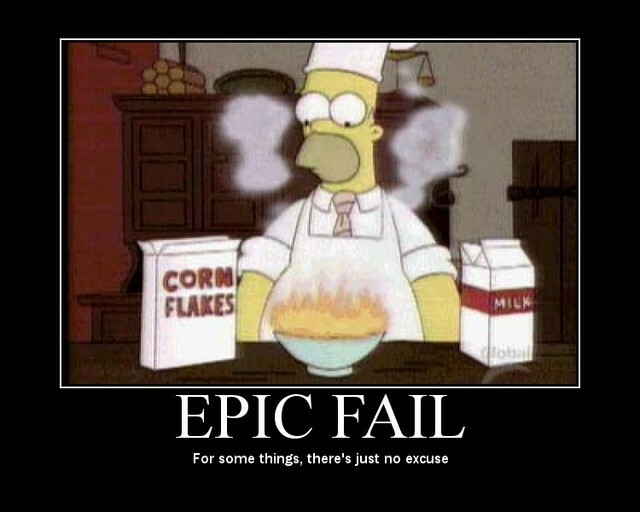 Why is “fail” become such a popular Internet meme? For more, visit my original article at Clearance Bin Review.